We made this vibrantly colorful and delicious creamy torte at one of my cooking workshops. It smelled divine, looked beautiful and tasted even better. I still cannot forget this cake's creamy texture and fresh smell. Everyone loved it! It is also fairly easy to make and you can use your favorite (seasonal) berries and fruits as a topping. Just imagine eating this beauty on a tender summer night after a lovely vegan dinner. Happy preparing (since it doesn't need any baking)! PS! Before you start making this cake, be sure the coconut milk cans have been in the fridge over night or at least a few hours. Crush the almonds with a food processor or a blender. Add dates and crush some more. Add plums and process everything into an even mixture. Grease a cake pan and cover the bottom with a round parchment paper. Now press the crust ingredients evenly onto the bottom. Put the crust into a freezer until you prepare the topping. Take the coconut milk cans out of the fridge and flip them upside down. Open them, pour away the liquids and scoop the hardened coconut cream into a deep bowl. Add sugars and whip the cream until more fluffy. Take the crust out of the freezer. Pour the the whipped cream onto the crust and spread it out evenly. 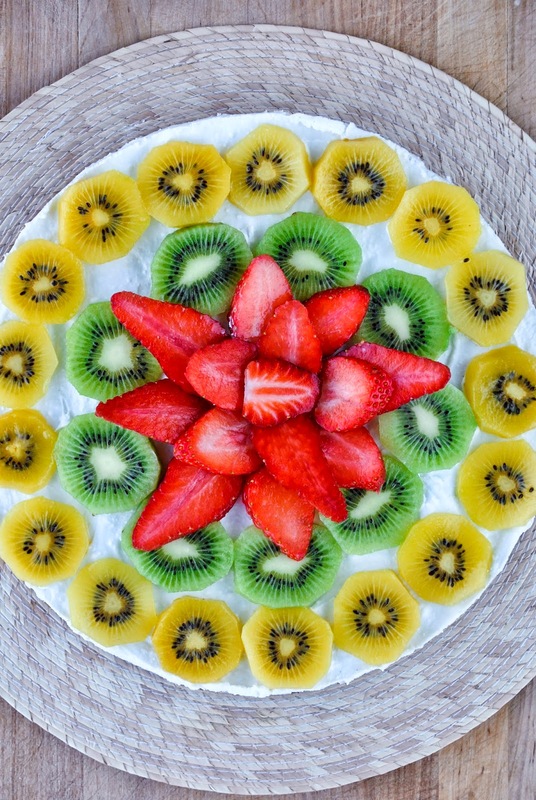 Decorate with your favorite fruits and berries (I used yellow and green kiwis and strawberries). Serve right away or keep the torte in the fridge.